Leveraging machine learning to build and train predictive models that improve business productivity with Azure Machine Learning. Applying an AI-powered search experience and indexing technologies that quickly find information and glean insights with Azure Search. Building applications that integrate pre-built and custom AI capabilities like vision, speech, language, search, and knowledge to deliver more engaging and personalized experiences with our Azure Cognitive Services and Azure Bot Service. Today, we’re pleased to share several updates to Azure Cognitive Services that continue to make Azure the best place to build AI. We’re introducing a preview of the new Anomaly Detector Service which uses AI to identify problems so companies can minimize loss and customer impact. We are also announcing the general availability of Custom Vision to more accurately identify objects in images. From using speech recognition, translation, and text-to-speech to image and object detection, Azure Cognitive Services makes it easy for developers to add intelligent capabilities to their applications in any scenario. To this date more than a million developers have already discovered and tried Cognitive Services to accelerate breakthrough experiences in their application. Anomaly Detector is a new Cognitive Service that lets you detect unusual patterns or rare events in your data that could translate to identifying problems like credit card fraud. Today, over 200 teams across Azure and other core Microsoft products rely on Anomaly Detector to boost the reliability of their systems by detecting irregularities in real-time and accelerating troubleshooting. Through a single API, developers can easily embed anomaly detection capabilities into their applications to ensure high data accuracy, and automatically surface incidents as soon as they happen. Common use case scenarios include identifying business incidents and text errors, monitoring IoT device traffic, detecting fraud, responding to changing markets, and more. For instance, content providers can use Anomaly Detector to automatically scan video performance data specific to a customer’s KPIs, helping to identify problems in an instant. Alternatively, video streaming platforms can apply Anomaly Detector across millions of video data sets to track metrics. A missed second in video performance can translate to significant revenue loss for content providers that monetize on their platform. With the general availability of Custom Vision, organizations can also transform their business operations quickly and accurately identifying objects in images. 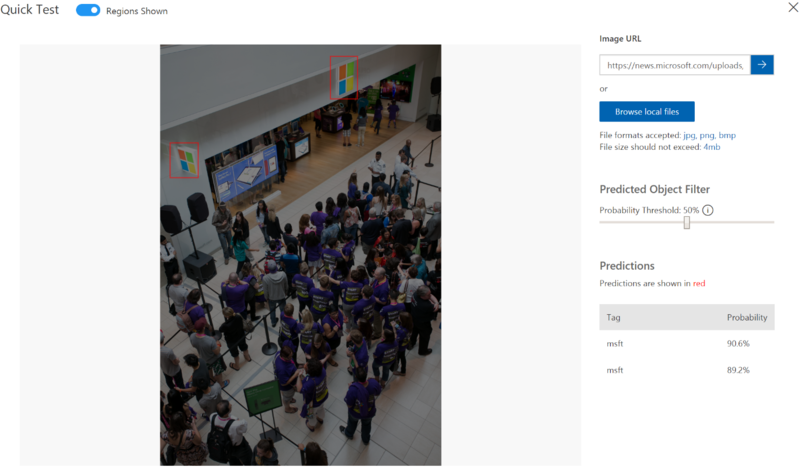 Powered by machine learning, Custom Vision makes it easy and fast for developers to build, deploy, and improve custom image classifiers to quickly recognize content in imagery. Developers can train their own classifier to recognize what matters most in their scenarios, or export these custom classifiers to run them offline and in real time on iOS (in CoreML), Android (in TensorFlow), and many other devices on the edge. The exported models are optimized for the constraints of a mobile device providing incredible throughput while still maintaining high accuracy. Today, Custom Vision can be used for a variety of business scenarios. Minsur, the largest tin mine in the western hemisphere, located in Peru, applies Custom Vision to create a sustainable mining practice by ensuring that water used in the mineral extraction process is properly treated for reuse on agriculture and livestock by detecting treatment foam levels. They used a combination of Cognitive Services Custom Vision and Azure video analytics to replace a highly manual process so that employees can focus on more strategic projects within the operation. Screenshot of the Custom Vision platform, where you can train the model to detect unique objects in an image, such as your brand’s logo. High quality models – Custom Vision features advanced training with a new machine learning backend for improved performance, especially on challenging datasets and fine-grained classification. With advanced training, you can specify a compute time budget and Custom Vision will experimentally identify the best training and augmentation settings. Iterate with ease – Custom Vision makes it simple for developers to integrate computer vision capabilities into applications with 3.0 REST APIs and SDKs. The end to end pipeline is designed to support the iterative improvement of models, so you can quickly train a model, prototype in real world conditions, and use the resulting data to improve the model which gets models to production quality faster. Train in the cloud, run anywhere – The exported models are optimized for the constraints of a mobile device, providing incredible throughput while still maintaining high accuracy. Now, you can also export classifiers to support Azure Resource Manager (ARM) for Raspberry Pi 3 and the Vision AI Dev Kit. For more information, visit the Custom Vision Service Release Notes. Today’s milestones illustrate our commitment to make the Azure AI platform suitable for every business scenario, with enterprise-grade tools that simplify application development, and industry leading security and compliance for protecting customers’ data. To get started building vision and search intelligent apps, please visit the Cognitive Services site.